My So- Called Handmade Life: To Pick or Throw? 100% wool makes me feel invincible. I know this is looking a little puckered and is all squished up on a very short circular, but blur your eyes with me and imagine what it will be like all blocked out. It will be nice and smooth. It's been a while since I've tried fair isle and so I'm out of practice using both hands to knit at once. I first tried the two handed technique on Scallop of the Sea and, once I got the hang of it, the colorwork just flew by. 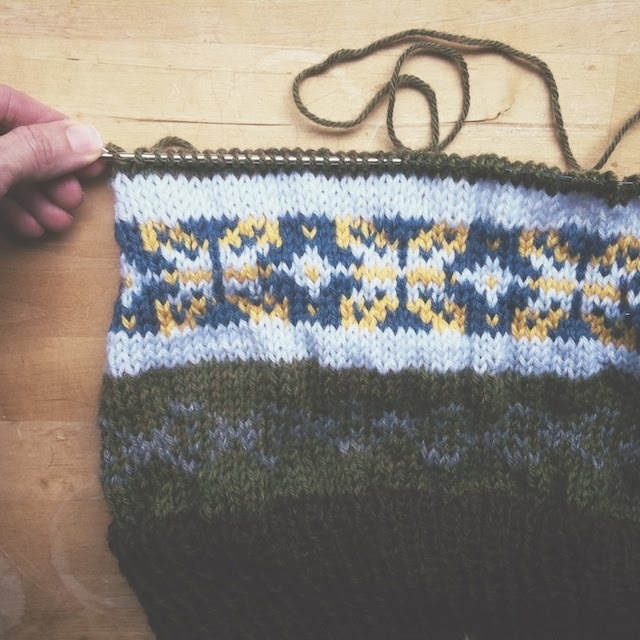 The designer, Rohn Strong, posted a link to this fair isle tutorial on his blog and it refreshed my memory and gave me a little confidence as I decided which color would be held beneath the other. I feel like my tension is more even when I throw both strands of yarn with my right hand, but I'm trying to only throw my background color with the right hand as I pick the foreground yarn with my left. Whatever, the most important thing is that I carry my floats loosely. If you're curious about all of this "picking" and "throwing" business just click the link and know that it has nothing to do with the banjo. It doesn't look as though I have carried the floats loosely in these photos, but I think I must have. I keep spreading out my stitches on the needle as I work and periodically stretch things to make sure there is plenty of give. I'm also checking my gauge because it's my new habit, for now. I may ask the Ravelry group if it seems normal, but I'm not going to sweat it. I feel most natural working with real wool, so I'm going to trust my instincts. I just gave myself a pep talk over a sweater. Ooh, you're inspiring me to knit this sweater! Goody! Do it! I would love to see your color choices. Since it's worsted weight, you may have enough stash to knit this one, Evelyn. Ooooo I love the colours! 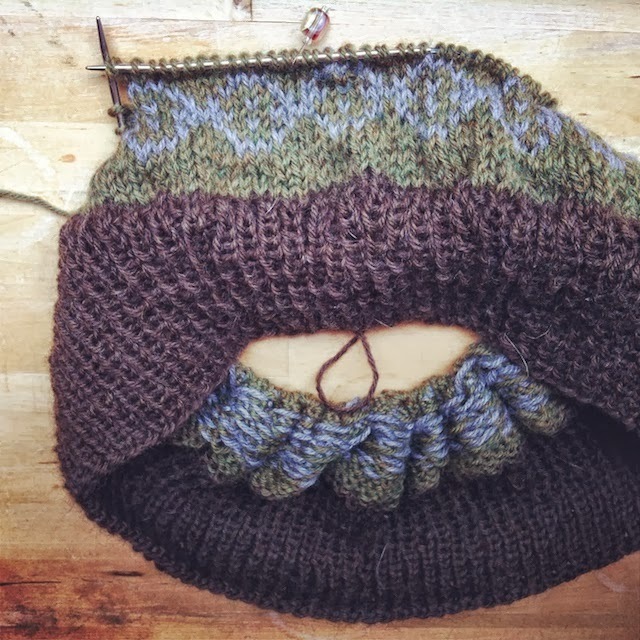 I've just finished a delicate colourwork hat (on which I still have to weave in 53 bajillion ends) and am currently working on a two-toned hat for a friend with a not-really-suitable-for-work image on it. :D I'm really excited to make a colourwork sweater someday though, so I'll be watching your progress on this one carefully! Love how the colors are knitting up so far! No worries about it looking smooth and even after a magical blocking. Picking is a lot faster, but I actually prefer throwing with my right-hand because it makes for a more even fabric for me. So gorgeous! You're always working on something amazing. I throw my yarn. When I do fair-isle I can get an even tension picking and throwing on the knit side, but not purl. I have to throw both yarns on the purl side. So weird! So anything in the round works best for me. I'm going to check out those tutorials! Oh gosh, I LOVE it! I am long overdue to do some instarsia - you are super inspiring. You do know that, right?! So far the end weaving looks as though it will be pretty minimal. I carry all the colors for each large band of fair isle up the sweater. So, it should only be 53 million, not bajillion, for me. I have a hat craze lately too. I think it's because we finally had a cold snap. I prefer using my right for both too, Tien. In fact, I've pretty much just gone back to doing it without realizing it. Thanks for the encouragement about the blocking. I felt like it would smooth out okay, but was still a little concerned about it. Oh wow, I've never done fair isle that wasn't in the round. That sounds challenging! And thanks, Stephanie! The site with the tutorial, By Gum By Golly, looks like a treasure trove of vintage knitting tips. I didn't know that, Libby! To my family I'm just a tad obsessive, so that's nice to hear. :) Winter makes me think- hats, colorwork, tweed, and super bulky. I'm going to go dig through all of your FOs on ravlery to see your color work because I know it's going to be amazing. That's going to be gorgeous. I love doing fair isle with two hands.